We’re just a few days away from our Decolonizing the Internet conference in Cape Town, where we’re bringing together unusual and unlikely allies – people who, like us, think about knowledge and the internet – to meet, talk, and scheme about how to bring different forms of knowledge onto the internet. We’re excited for nearly 100 attendees to share their insights and to challenge and inspire us to think creatively and actively about how to #DecolonizeTheInternet together. In the lead-up to the conference, we’ve asked a few participants to answer some questions about what interests and excites them about this work. Our conference attendees come from all different backgrounds and corners of the world, and if we’re going to correct the exclusion and marginalization of so many voices on the internet, we need a global community of us working together, sharing ideas, and taking action. 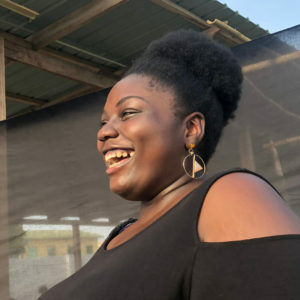 In this mini interview, we asked Maame Akua Kyerewaa Marfo, a singer, feminist and writer, to tell us a little about what brought her to these issues and what #DecolonizeTheInternet means to her. 1.) Tell us a little bit more about you and what brings you joy (your work, your passions, your interests)? For me, what brings me joy is organizing, being present and being creative. I’m passionate about the ability of art to change our world. I believe that by speaking truth in the most earnest and upfront ways we can we can truly change it. Art can be transformational on an individual level and on a collective level as well. There’s a reason why movements are only powerful when they thrive and allow for dissent– it’s because then they reflect honesty. As a part of my job I help amplify African women’s voices and show all the ways in which African women are able to truly transform their worlds and communities. By putting forward a narrative that focuses on empowerment, we can thwart the preexisting ideas about the capabilities of African women. That’s powerful and exciting and I’m glad I get to be involved in this kind of revolutionary truth telling. 2.) What does ‘decolonizing the internet’ mean to you? Decolonizing the internet means putting the narratives that are traditionally erased out there into the world. It means being in control of the content that is posted about the continent. It means having people speak for themselves and be allowed to be the authority on their own histories, cultures and people. It means making the internet a place that is not owned by just silicon valley. But one that is owned by globe itself and multitude of peoples on it. 3.) What excites you about the Decolonizing the Internet conference? I’m excited to meet people who engage the internet in different ways, who encourage subversion and truth telling. I’m excited to meet innovators and women who are organizing. I’m excited to learn alternative histories and be in a room with people who tell stories, the important ones. Kira Allmann is Communications Lead (Media Relations) at Whose Knowledge?.